The Artecorte Community Project is a nonprofit organization founded by Gilberto “Papito” Valladares in 1999. Papito saw the need to create a cultural project to reunite barbers and hairdressers to promote and dignify their trade. Along the way, volunteers and artists started collaborating with Artecorte and helped to turn it into a nation-wide phenomenon. Artecorte began to tour across the country performing in several art-and-hair-related public shows. After several years Artecorte evolved, changing its goals and settling in the Holy Angel (Santo Ángel) neighborhood, in Old Havana, and started a partnership with the Office of the Historian of the Havana City, transforming into what is today, a Local Development Community Nonprofit Organization. To physically and socially transform our community. To promote channels for social participation. 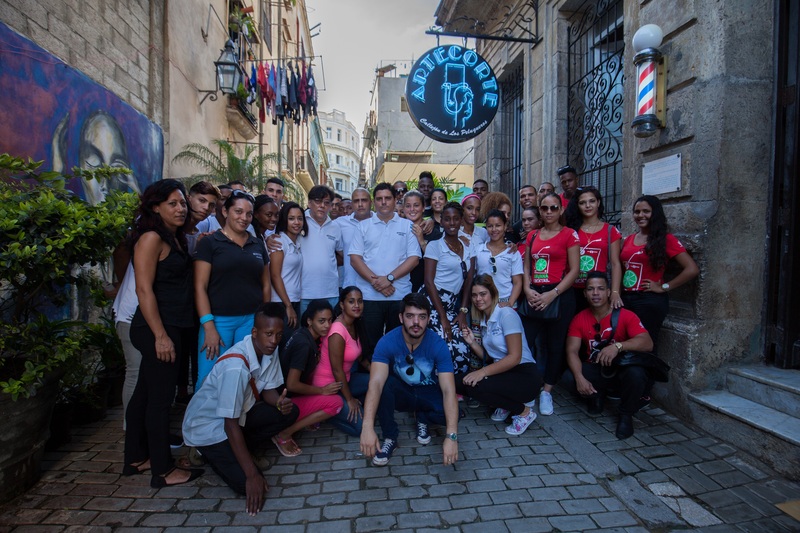 To help our neighbors become more sensitive to the work of conserving, restoring, and valuing the tangible and intangible cultural heritage of both the neighborhood (Santo Ángel) and the historic center (Old Havana). To improve living conditions by incentivizing both individual and collective neighborhood initiatives. To train neighborhood youth in traditional trades and helping them find employment. To promote local entrepreneurial solidarity. To develop a culture of environmental protection. To guarantee generational integration and gender equality. To share our experience with the aim of supporting the similar development of other communities. Painting program for kids aged 6-11. Badminton program for kids 9-11. Futsal program for kids aged 10-13. Hairdressing and Barber program for young adults aged 17 to 30. Bartending program for young adults aged 18 to 30. Carpentry program for young adults aged 18 to 30. Clown shows every Saturday at our playground, the Barber’s Park. Workshops and weekly activities at the Senior’s Center “Nueva Vida” (“New Life”), including a weekly dance party for the seniors. Many of these programs and activities are executed in partnership with public and private nonprofits, institutions, companies and other types of organizations. Several young professionals have joined Artecorte in leading positions, including Camilo Condis, its Senior Manager, and Adriana Ricardo, Manager for Community Programs.